and Northeast Pennsylvania Audubon Society President Sarah Hall-Bagdonas. Michael Burkhardt is this year’s scholarship winner. Michael is a 2015 graduate of Western Wayne High School and is the son of Carol and Mike Burkhardt of Waymart. He will be attending Keystone College to study Wildlife Biology. 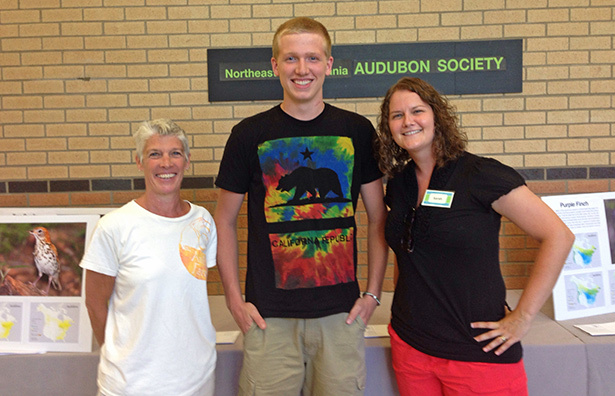 The Northeast Pennsylvania Audubon Society is proud to support the youth of our area through college and camp scholarships. The funding for these scholarships is generated from the Art and Craft Festival held each July in Hawley.